More than 100 pupils who promote sport within their schools have received special recognition at an event held by Plymouth University. 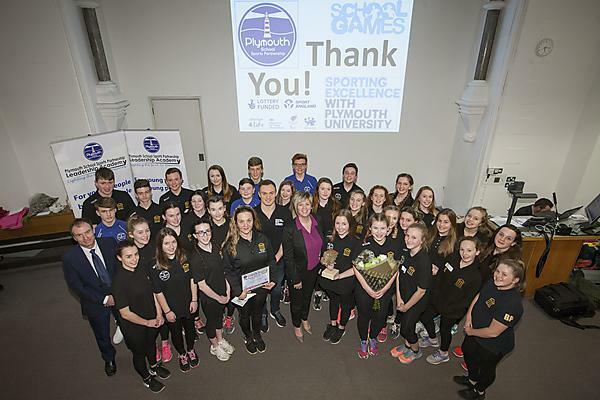 Young ambassadors for the Plymouth Schools Sports Partnership (PSSP) met athletic role models from the University and furthered their skills in promoting sporting opportunities at the celebration event last week. The pupils, who came from secondary schools all over Plymouth, were invited to the day as a reward for their hard work leading, coaching and promoting sport within their schools and throughout the city. Following workshops in sports media, event planning, sports officiating and team management, the students were visited by University Sporting Excellence Scholar and swimmer Antony James, who gave some words of wisdom on how he has developed in his chosen discipline. Awards, which are named after PSSP honorary Olympic patrons, were also presented to those whose work throughout the year had gone above and beyond. These awards had been designed and made by the University’s graphic design students. The Sarah Barrow Award for the Leadership Academy of the Year was won by Hele’s School, The Tonia Couch Award for Young Ambassador of the Year went to Grace Elliot Smith and The Andy Banks Award for the Best Overall Contribution to the PSSP was won by Claire Murray and Hayley Jarvis. Howard Turner, PSSP Leadership and Volunteering Coordinator, said the day had been inspirational for all of the pupils involved. The PSSP is a joint partner of Plymouth University and its Student’s Union (UPSU), with support from the Relays@UPSU programme and volunteers. Relays@UPSU is a project which offers a range of creative outreach activities and events for school pupils and young people, focused around sport, culture and education, whilst providing exciting volunteering and training opportunities for student volunteers who would like to work with young people. The project aims to increase the profile of Higher Education and raise the aspirations of young people by showcasing the extra-curricular activities that are available at University, and compliments the work carried out by Plymouth University in supporting under-represented groups to successfully progress to Higher Education.